Probably one of my favourite places to photograph in the Phoenix Park. This is an old derelict magazine fort situated quite near the football pitches, for those who never veer off the main road in the park, you need to turn left at the first roundabout after coming in through the main gates. Then you follow the road around until you see a right hand turn, just look up from there and you can’t miss it. Maybe I shouldn’t be giving away all my favourite secret locations, but sure it’s all about sharing isn’t it. I love this shot because it kind of looks like the building is actually looking at me in the photo, it looks like some medieval battle mask, you can almost sense the dark eyes hidden behind the rectangular slot. The ivy and moss growing on the wall showed up really well under infra-red light and the sky was just amazing on this particular day. I have to say I just love the anticipation with infra-red photography, you sometimes have no idea what a photo is going to look like until the shutter has been pressed. I love the darkness of the sky too, it just makes the shot that extra bit haunting (or evil). I find something very haunting about this particular place, I have found lots of shots from inside the building but somehow I prefer not to know what it looks like inside, it kind of adds a certain mystique to the place. I love walking around the perimeter of the building up on the hill and making up all manner of scenarios as to what life was like inside when it was inhabited. I have an entire series of photos from this area posted up on my Flickr page and you can click here to check them out if you want. You can purchase prints or postcards of his photo from as little as €2.50 by clicking this link. 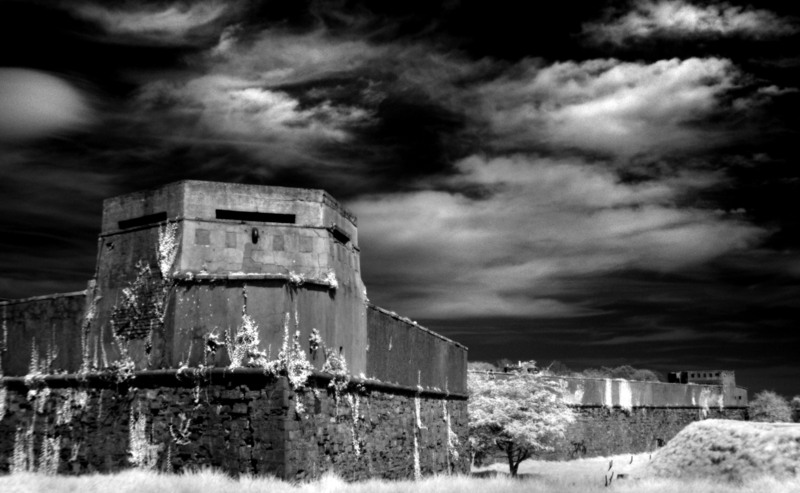 This entry was posted in Black and White Photography, Infra-red Photography, Irish Landscapes, Phoenix Park and tagged Black and White, Infra-red Photography, Phoenix Park. Bookmark the permalink. ← The First Ever Deer-Bird.